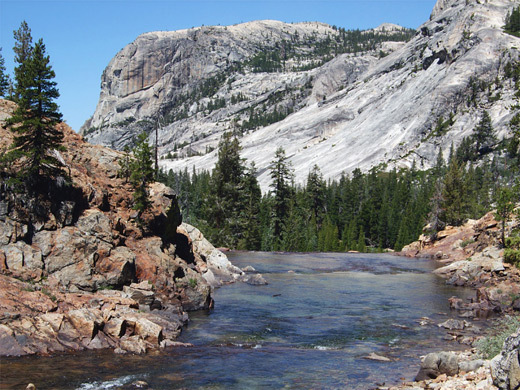 The splendor and variety of the Alpine landscapes en route make the Glen Aulin Trail perhaps the best of the two dozen or so day hikes beginning along the Tioga Road in the high country of Yosemite National Park. It starts from the east end of Tuolumne Meadows and follows the Tuolumne River downstream to the Glen Aulin backcountry campsite, from where other paths branch off in three directions including one (the Tuolumne River Trail) that continues descending all the way into the Grand Canyon of the Tuolumne. 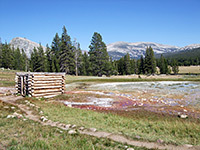 The 5.3 mile path to the campsite starts off next to a small but colorful collection of warm pools (Soda Springs), then traverses flat, partly wooded land for a few miles as the Tuolumne River winds lazily across lush meadows, allowing good views of many jagged peaks to the south, in the Cathedral Range. 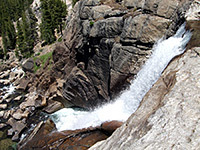 The character changes quite abruptly when the river descends a boulder-strewn granite slope, forming innumerable falls, cascades and deep, clear pools, as the land on most sides becomes steep and mountainous, especially to the northwest, where sheer thousand foot cliffs of beautiful smooth white granite rise sharply up from the valley floor. 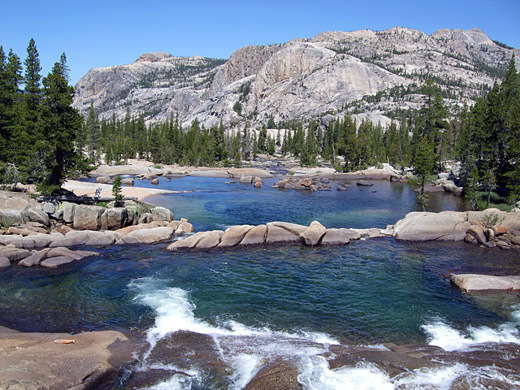 The two largest waterfalls are Tuolumne Falls and White Cascade, the latter just before the campsite, which is reached after a moderately strenuous descent of 450 feet over the last mile of the trail. Three other major falls further downstream are visitable via a longer hike, of up to 8.2 miles one-way (to Waterwheel Falls). One quality not offered by the Glen Aulin Trail is solitude, as the route is often very busy, both with day hikers and backpackers heading to the campsite and the other connecting paths, but the excellent scenery makes up for that. Glen Aulin Trail topographic map, Tuolumne Meadows trails. 25 views along the Glen Aulin Trail - gallery, slideshow. Cascades on the Tuolumne River, promontory along the trail. Tuolumne River (mp4; 1:34 min; 18.2 mb). There are two possible start points for the hike to Glen Aulin; most people use the parking lot at the Lembert Dome trailhead, just off the Tioga Road along a short side track to Parsons Memorial Lodge. More parking spaces are available on verges either side of the track. The other option is to park along the highway itself, one mile west, near the national park visitor center, since from here a connecting path crosses Tuolumne Meadows and links with the track, joining it near the lodge. This route is more scenic because there are no trees to block the views, and the path passes several picturesque streams and pools, as well as the river itself, a good fishing location. The two approaches converge beside Soda Springs, a collection of gently bubbling, orange-red pools, whose geological origin is uncertain. The largest spring is enclosed in a wooden hut, built by early settlers to keep livestock away. The track continues a little way further to Parsons Lodge, while the Glen Aulin Trail (also part of the Pacific Crest Trail) leaves on the far side, past a sign marking the edge of the Yosemite Wilderness. It climbs gradually alongside a meadow then enters open pine forest, and for 2 miles is largely out of sight of the river, passing occasional grassy clearings, granite outcrops, boulder piles and dry creeks, plus two larger drainages (Delaney Creek and Dingley Creek) that flow year-round. This section of the path is level, shady and not so interesting but still quite pleasant. A junction with the Young Lakes Trail on the right is reached after one mile, followed by more sparse woodland and the first of two bigger areas of granite slickrock, after which the path comes close to the river, and to a fine viewpoint back south along the valley towards Cathedral Peak and adjacent mountains. To the west, the river now begins to flow over bare rock, forming big shallow pools linked by whitewater cascades. The second patch of slickrock precedes a short belt of trees, before the path comes out onto a promontory (see panorama), giving the first views of the spectacular scenery that lies ahead, where the river enters a stark landscape of granite boulders and cliffs, framed by tall mountains to the north and south. The Glen Aulin Trail drops down quite steeply through woodland, crosses the river on a footbridge, then turns away for a while to bypass the first of three main waterfalls, an unnamed drop that can be seen via a short off-trail walk. 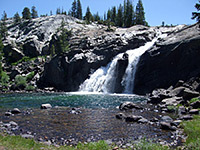 The second is Tuolumne Falls, a tall narrow torrent into a deep pool (see panorama), while the largest is White Cascade, below which is a much bigger pool, as the river crosses a temporarily level stretch of ground, close to the Glen Aulin High Sierra Camp. There are many other smaller cascades between these three, and the sequence looks particularly impressive when viewed from above looking downstream, especially with the smooth slickrock slopes of Wildcat Point rising above in the distance. Near the end of its descent, the path meets the Murphy Creek Trail from McGee Lake and Polly Dome Lakes, then re-crosses the river to a three-way junction; the campsite is to the right, the Tuolumne River Trail downstream is on the left, while straight on is the lesser used Cold Canyon Trail to Virginia Canyon. Glen Aulin is a flat, sheltered, mile long meadow just west of this junction, marking the start of the Grand Canyon of the Tuolumne, though the valley is not seen properly for another 2 miles west.